After spending a whole day travelling, I was finally loose in Thailand, something I have been anticipating for a long time. My goal was to stay a night in Bangkok and then make my way to Chiang Mai for the Loi Krathong festival, as it is meant to be particularly special there. My best friend Daniel would be coming to Bangkok from Phuket in the evening of the day I arrived, and I hoped to meet him. As I detailed in my last post, I took the air-conditioned train from the airport to Phaya Thai, at around 9AM local time. I was sleep deprived, exhausted, and wearing completely inappropriate clothing; I still had jeans on that I had been wearing in Croatia. As soon as I stepped out of the train, the heat hit me. Literally, the first thing you will notice about Bangkok is the heat and the humidity. The heat comes right at you and make you feel like you’ve been hit with a blast of air shot out of a cannon. And this happens whenever you leave an air conditioned space. The humidity is so high that your breathing doesn’t feel quite normal - you almost have to put in more effort just to breathe the air. 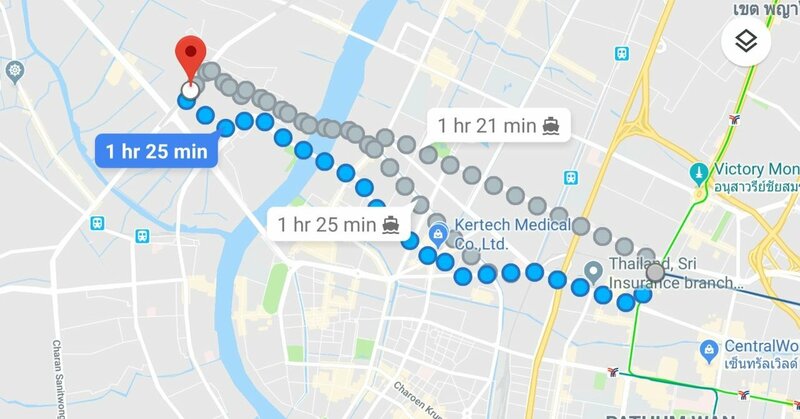 I had downloaded the map of Bangkok to my phone, and had bought local SIM with 4G at the airport, so I oriented myself and started making my way to the hostel I was staying at. It was an hour and a half walk away, which I figured would be doable. I considered taking some kind of transportation but decided I’d prefer to walk and actually see the city. 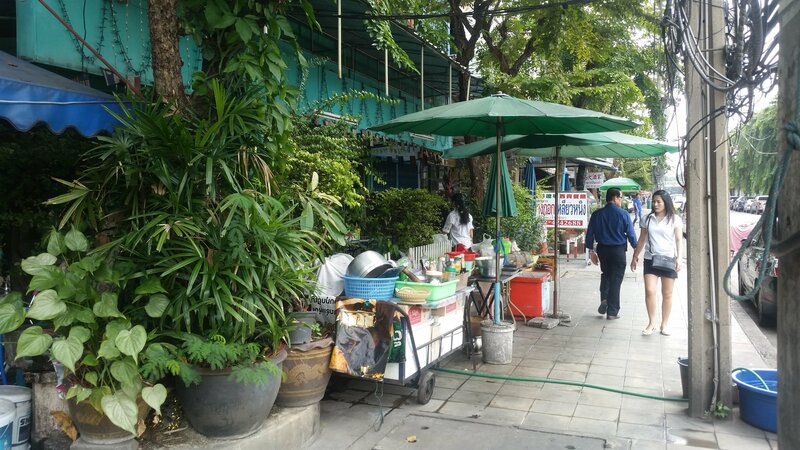 The second thing I noticed about Bangkok was the smell. It has to be experienced to be believed. There’s an omnipresent smell of mildew and exhaust fumes, and as you walk you will variously smell sewage, aromatic cooking and spices, rotting garbage, sweat, more exotic-smelling cooking, more sewage, raw meat and fish, burning plastic, and then yet more cooking and sewage. In short, it’s like attending an underground festival in a redneck trailer park that is being hosted by hippies. It isn’t necessarily pleasant but it has its moments. There were also pools of unexplained liquids everywhere, and fluids dripping from buildings and ceilings, which is kind of odd given that it clearly hadn’t rained in the last few days. Street food carts, like this one, are on basically every street or corner, even the small ones. 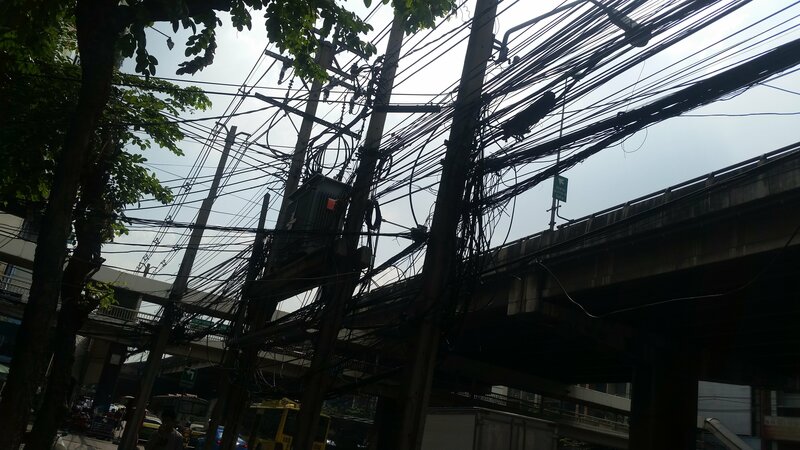 I had always believed that posts about the wiring in Asia were cherry-picking the worst places, but they aren’t. Terrible rat-nests of wiring are common. The power substations hum and crackle disconcertingly. In places, some cables are cut, dangling down with exposed copper at eye level. Not very reassuring! A nest of wires I happened to take a photograph of. Almost straight out from the train station I had a problem. I needed to cross the road. Not normally a problem, but here the traffic was too busy. Actually, busy is an understatement. The traffic here was too crazy. It was like a constant stream of mopeds, trucks, tuk-tuks, cars, and more mopeds. There was rarely a lul, and even when the lights went red, the motorbikes kept going. The jeans I was wearing seriously didn’t fit me (I have lost a lot of weight since I bought them), and they were threatening to mutiny and visit my ankles if I made any sudden movements. (You might wonder why I didn’t replace my jeans, but I figured it would be a waste of money to get tighter ones because I would be buying shorts as soon as I got to Asia). My jeans made me feel like I couldn’t safely cross the road; they could cause issues if I had to quickly get out of the way of traffic, and my range of motion was limited. Not to mention that I am slowed by my backpack. I noticed that there are these pedestrian overpasses in some places (I actually read about these on the WikiVoyage article - apparently even the stray dogs here use them to cross safely). I decided that the only safe thing I felt comfortable doing would be to cross using these exclusively. The problem I encountered was that sometimes I would get to a four-way crossing and need to just keep going straight; rather than stand in the blazing sunlight and wait and try to cross when it was less busy (ie never), I would just turn and keep going until I saw a pedestrian overpass. This strategy “worked” in that I felt safe and was usually eventually able to cross, but sometimes I wouldn’t be able to cross and would have to turn again. After a few consecutive crossings-and-turnings in a row, I got horribly turned around and ended up travelling south-west rather north-west like I had needed, which really delayed me. 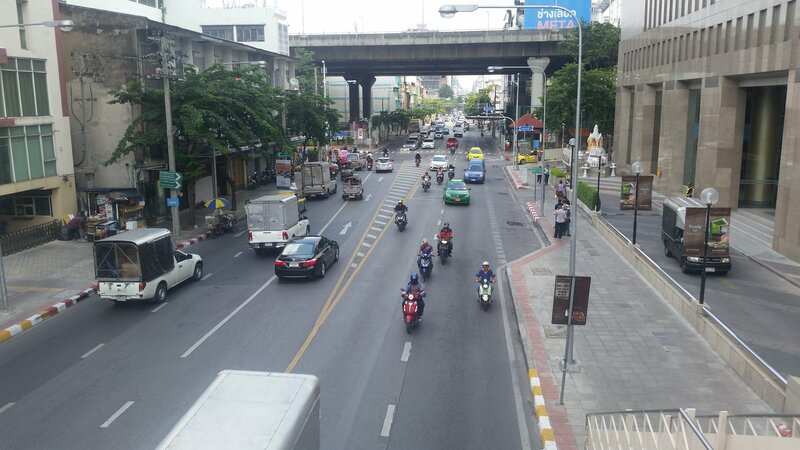 View from a pedestrian overpass. I had stopped in at a 7-Eleven (these places are everywhere) to buy water and snacks to eat; I ended up drinking 4.5L before I even got to my hostel and yet I was still dehydrated because I was sweating so much and because I hadn’t been able to drink much on the plane. Worse, the combination of sweat and condensation from the chilled bottle meant I was having a hard time using my phone because my hands were too moist. I found this (and the general experience I was having) so frustrating that I basically didn’t take any pictures on journey to the hostel. At one point I tried to get a Tuk-Tuk to my place, but his price was 200 baht (€5.34,£4.73,$6.06) for a ten minute journey, which just felt ridiculous. For the number of guys who would pull up next to me and insistently offer me a journey, they weren’t making their prices reasonable, so I refused all of them. I think they might have been trying to get more out of me because I clearly wasn’t having a great time. I generally found these Tuk-Tuk guys to be incredibly rude, as they would pull up really close to me (sometimes even on to the pavement) and try to pressure me into going with them. Or they would assume I wanted their services just because I was waiting for them to pass whilst I was trying to cross the road. Their practices even actually made things worse for me as they would blocking my path and make me miss opportunities to cross. 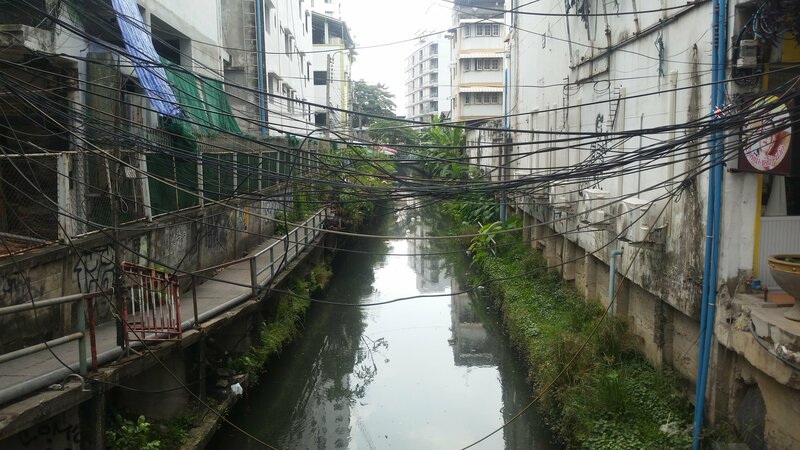 Historically, Bangkok was a city of canals much like Venice. Most were filled in, but many remain. In the end, I found that the easiest way for me to navigate (in my sub-optimal clothing) was to follow the canals. They were fairly straight and typically had less active roads crossing them, and the big roads generally had bridges I could pass under. Following the canals were unpleasant; the smell was terrible, and they were surrounded by collapsing shacks made of wood and corrugated metal whose materials spilled into the walkway. These shacks were strangely rammed full of people and they had little apprehension about pushing past the foreigner. Stray cats, dogs, and even chickens also roamed these banks. I had read that Thailand was called the ‘Land Of Smiles’, and that Thais are known for constantly smiling at foreigners. So far, the few people who had smiled back at me felt forced - almost like the kind of smile a North Korean peasant might give you whilst soldiers were nearby. The other Thais had merely shouted at me, glared at me, or tried to scam me. I just didn’t feel welcome here. By the time I had gotten to the place I would be staying for the night, my “one and a half hour walk” had turned into three. I was hot, covered in sweat, frustrated, and unhappy. Bangkok was not at all what I was expecting. I had read online things like “Asia has been rapidly developing, and it isn’t poor and dirty anymore.” and “Many places in Asia are more technologically advanced than the west.” but so far I hadn’t seen that. Things got even worse when I checked into the place I was staying. From the pictures I had seen online, I expected somewhere quirky and fun, with artistic graffiti painted on the walls. I expected it to feel alternative, a little run-down, but safe. But this place was completely filthy and definitely didn’t feel safe. There were cockroaches crawling all over the downstairs kitchen, dogs which growled at me and probably wanted to bite me, and there was animal poop on the floor. My room at The Overstay. The lockers in the room had missing doors, and the rest had evidence that they had been forced open in the past, and they were all too small to fit anything in anyway. If I can’t keep my stuff safe, how can I feel safe? 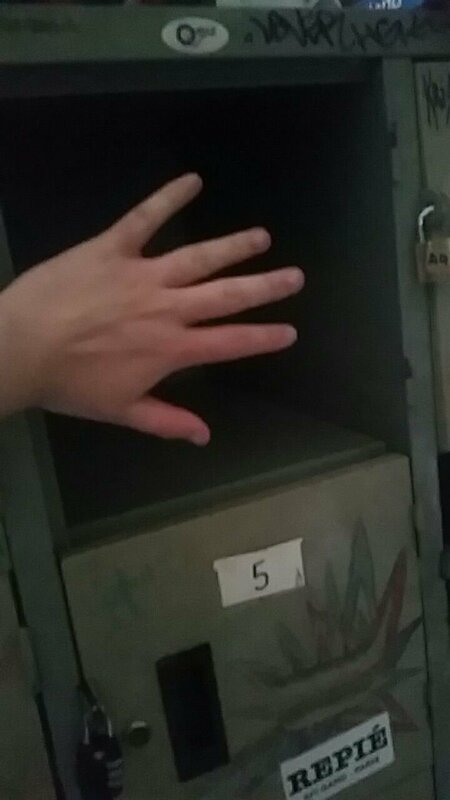 Tiny locker with missing door at The Overstay. I was too tired at this point; I had been awake for well over 30 hours, had been walking for three, and I just needed to rest. I padlocked my things to the bed and took a shower. The shower here was in the same room as the toilet, meaning that you’ll get water on the seat. The toilet even had a “flowchart” (pun intended) for what to do if the toilet won’t flush. The drains barely worked and my clothes ended up wet as the hook snapped off from the wall. I went back to my room and just took a nap for a few hours as I couldn’t deal with the situation. Oh, and the place had promised air conditioning on their website, but it only runs overnight between 10PM and 8AM. This, and other things like it, made me feel like the place was being dishonest on the platforms they were advertising on. I felt like the pictures were incredibly selectively taken to best-highlight the place, and that rooms had been specially cleaned for the photographs. When I went back and looked, I think I actually noticed the same rug in several photos of different rooms, as if they had moved their best furniture into the photos of each room. They promise an ‘exercise room’ (not that I planned to use it), but it’s actually just a single weight machine. I wasn’t impressed at all, and I felt lied to. The more I looked, the more I actually felt like this place could be featured in some kind of horror movie and fit right in. The mood wasn’t helped by the fact that there was a demonically painted Pikachu hidden in a corner with upside-down cross drawn on it’s forehead. I also considered looking for a different place to stay overnight. Everything here was just so dark and weird. It became clear to me that it was actually just a club or bar that they had converted to offer rooms. The dorm room walls were clearly not part of the main structure and were made of a really thin material attached to metal bars. In one place there was a huge hole that was just covered by a poster. The place felt so weird that I had to record a video to capture the sheer creepy-factor. I wanted to head back out to the city with my shorts and a lighter backpack. I unloaded everything that I wouldn’t miss into my larger backpack and locked it to the bed, and headed out into the city with basically just my laptop and a few valuables, which was much lighter. The only shorts I had were ones I that I had used to run in all weather in Europe; they were thick but light, with minimal pockets. They were never going to do for everyday wear in Asia. I asked Daniel where a good place to find new shorts might be, and he recommended Siam. 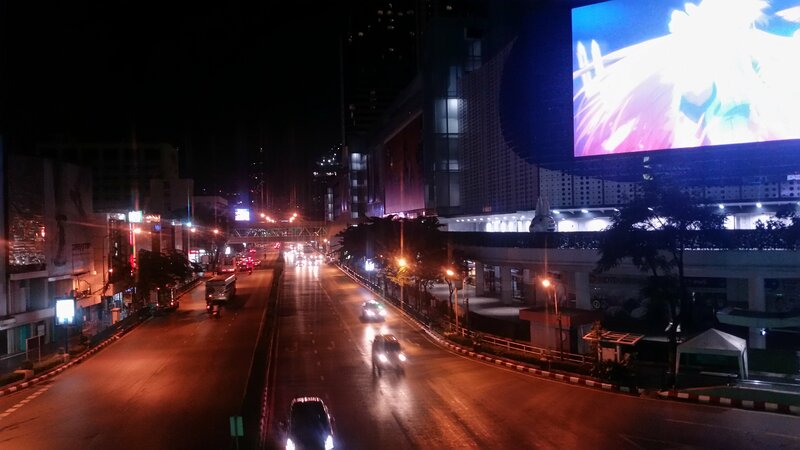 It was around 7PM when I made my way to Siam, and I actually didn’t find the traffic too bad at this time of night. It was dark now, and things were a lot less warm too. Having shorts and a lighter load definitely helped, and I felt comfortable making my way through the city. Siam was much closer to what I expected from Bangkok. It was developed, and clean, and the people here were genuinely friendly. 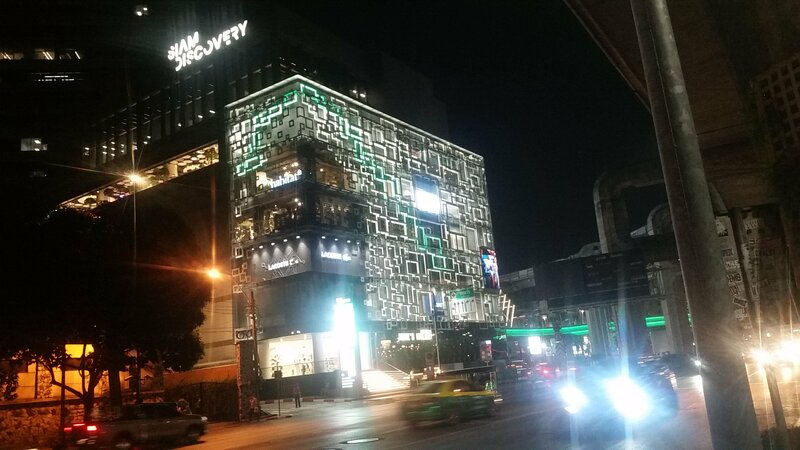 I entered Siam Discovery first, which actually reminded me of somewhere like John Lewis in the UK. Lots of designer clothes stalls all over, and basically all of it was far more expensive than I was willing to pay. I saw a single pair of shorts for 2100TBH (€56,£50,$64). At Daniel’s advice, I left and went to Siam Paragon instead, skipping Siam Centre. The ground floor of Siam Paragon is this huge expansive food court. Every time you think you’re at the end you aren’t - it just keeps going. I wish I took a picture but I forgot to. I headed upstairs to find shorts. I first checked out Uniqlo, but couldn’t find any shorts with good zips. I was keeping in touch with Daniel the whole time, so when I exited the changing room, there he was. Meeting up once more with Daniel! I found some shorts I liked at H&M. They were still quite expensive but at this point I had decision fatigue (I HATE shopping!) so I just bought them. Dan and I went to the food court to eat; I couldn’t find too much vegan here, but there was a small shop that sold rice with vegetable sides, and I picked what I believe to be sides of roasted pumpkin (with Tofu), and vegetables. 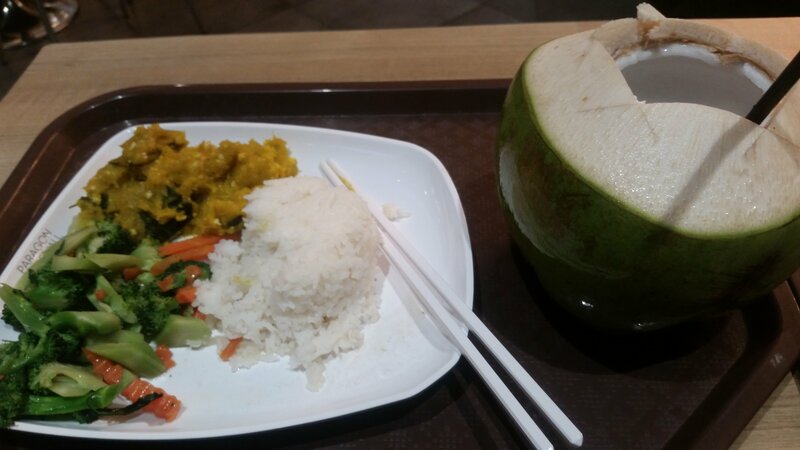 We also bought Coconuts as a drink, and mango sticky-rice for dessert. 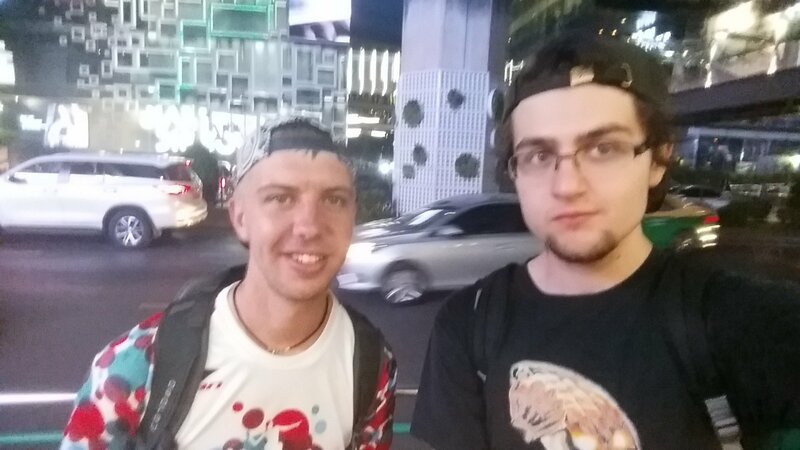 It was cool to meet up with Daniel, and I think for him it was an interesting turn of the tables; when he first arrived in Bangkok, Pieter showed him around. Now Daniel was the mentor! Rice with sides of veggies and roast pumpkin with tofu, plus a coconut to drink! 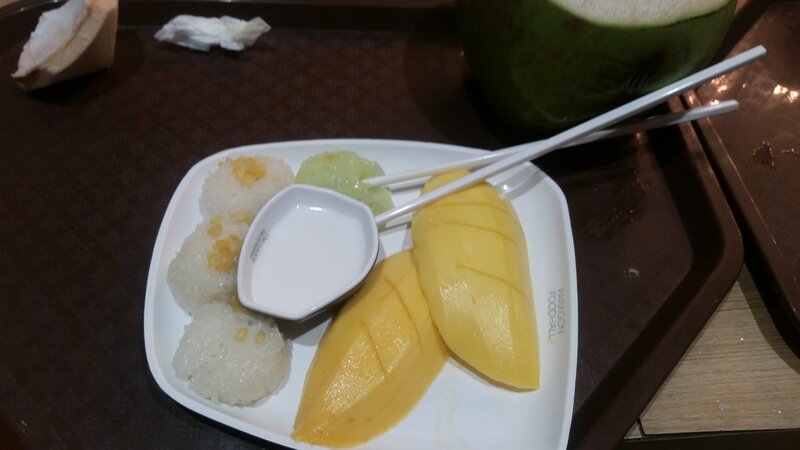 Mango sticky rice, an incredibly tourist-y meal. Served with Coconut Milk. It was now 9PM and Daniel hadn’t yet booked himself into any accommodation, so he looked on his phone for some places as we wandered around. I joked that he should come and stay at The Overstay with me. Instead, he found the nearby Chao Hostel, and it honestly felt like a palace. For just £8 he was staying in a shared room in this great place on the eighth floor of downtown Bangkok. It was clean, positive vibes, and had a great view of the city. Wow! If I hadn’t left my stuff at The Overstay, I would have jumped ship and stayed here too! 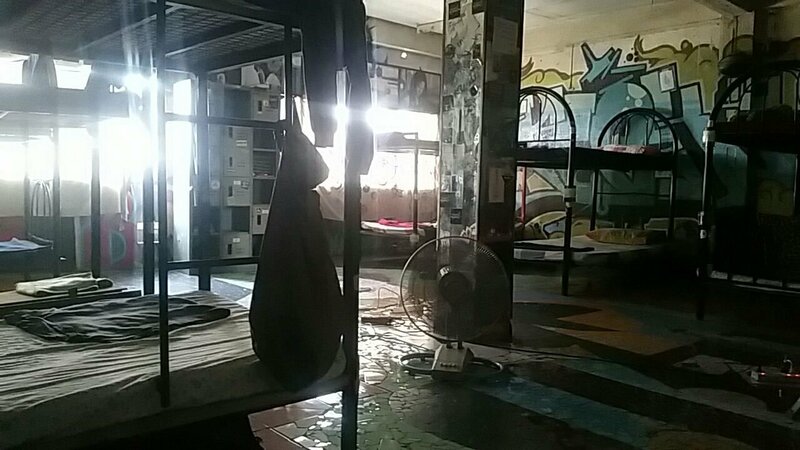 Chao Hostel. I wish I stayed here! We wandered around all evening, and Bangkok started to grow on me. I think I had just had a bad experience earlier in the day, and that if I was wearing more appropriate clothing I would have had a better time. There’s a lot to see and do in Bangkok. Daniel and I talked about how you could probably spend years properly exploring the place. The sheer number of 7-Eleven stores here is just silly. You can be standing outside one and see another just a little way down the street. We actually made a game of counting them as we wandered around. They’re quite convenient to buy water and electrolytic drinks, as well as offering snacks that are cheap relative to the west, but expensive relative to local meal prices. A 1l bottle of water might cost you between 13 to 22 baht from here, whilst the reverse-osmosis machines which are prevalent will give you 1l of safe water for 1 baht. Eventually Daniel and I went our separate ways, and I walked back to The Overstay, already dreading it. A huge chunk of rubber actually ripped off from the soles of my trainers on the way back, in part because they are so worn out, but also because the road surface was quite bad. Before I went to sleep, I tried to book the sleeper train to Chiang Mai, but found that most of the tickets were sold out, presumably due to the festival. Daniel had not had any trouble buying the day before departure, so perhaps this train was especially full due to the festival. In fact, there appeared to be just one ticket left, in the third-class ‘sitting’ cabin, on one of the older trains that doesn’t have air conditioning. Hmm… I’ll tackle that when I get to it, but 291 baht (€7.78,£6.88,$8.82) for a 14 hour train journey that is going 700km is extremely reasonable. My sleep at The Overstay wasn’t great; it’s right next to a main road and so the traffic was very loud, and I got bitten all over by bedbugs. There was a glass window to the rest of the building right by my bed for some reason, so light kept streaming in, and I’d be disturbed any time somebody walked past. In the morning, I thankfully left The Overstay and met back up with Daniel, leaving my stuff in his room. Again, having better clothing really made things better, even in the daytime, and I was much more confident making my way through the traffic. We ate at Siam Paragon again (I even had the same meal), before leaving to visit one of the few parks in Bangkok. 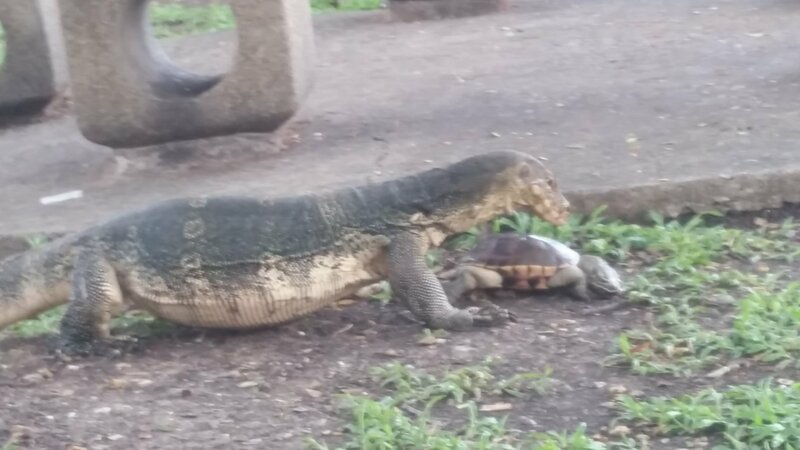 There, we saw a Water Monitor catch a dead turtle and attempt to eat it, before it was scared away by crows. Later, some military guys came and scared away the crows, and threw the dead turtle back into the pond. 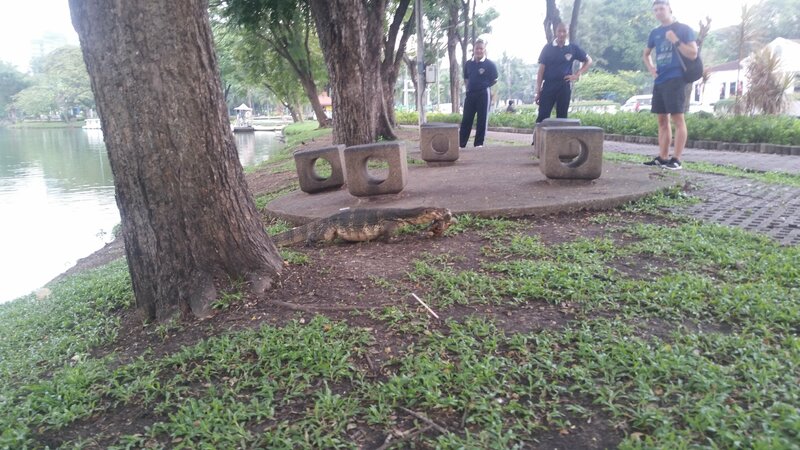 A Thai guy (who was really struggling with English) came over and told us that 400 such Water Monitors (though he called them ‘Alligators’) live in Bangkok, and that they mostly don’t harm humans, but he knows of a case where one killed a little girl. He was a pretty interesting guy; When we told him we were from England, he told us he was big into The Prodigy and was a fan of the snooker player Ronnie O’Sullivan. There were lots of runners in this park, and I wanted to try running with them, but Daniel needed some time to recover from his run in Phuket, so we didn’t. The park was enormous, but the city is so much bigger. We went back to Siam Paragon and ate at the Royal India for dinner. 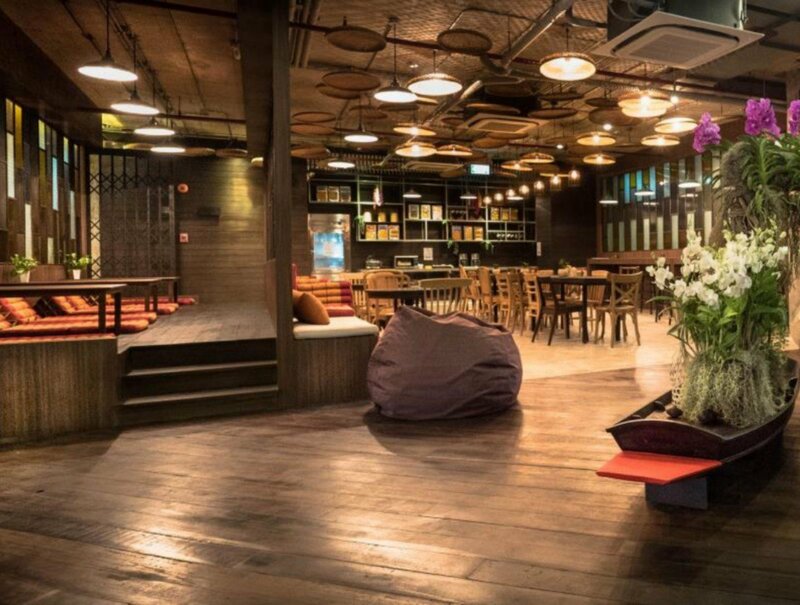 Later, we chilled in the lobby of Chao Hostel for a little while. Daniel was also looking to go (back) to Chiang Mai, but he wasn’t particularly fussed about seeing the festival. He booked an overnight train ticket that would arrive after the festival was over (when the trains would be less booked), meaning we’d meet up in four days. I made my way (alone) to the train station at 9PM, bought a handful of drinks from a 7-Eleven, and boarded at 9:30. We would be leaving at 10PM, for a 14 hour journey, arriving in Chiang Mai at 12:30 (just after noon). I was quietly optimistic. All in all, I left Bangkok on fairly good terms. My issues here were my own. I just had to adapt to the city and it’s culture. I hadn’t understood the place, had come with preconceived notions, and I had made quite poor decisions. Bangkok wasn’t such a harsh place after-all. I just needed to get to know her first.